With the recent downpour of rain in Orange County finally subsiding (fingers crossed), we’re ready to wipe away that layer of dust settling on our shelves, clean out those cluttered closets, and feel as light and breezy as the incoming California spring. 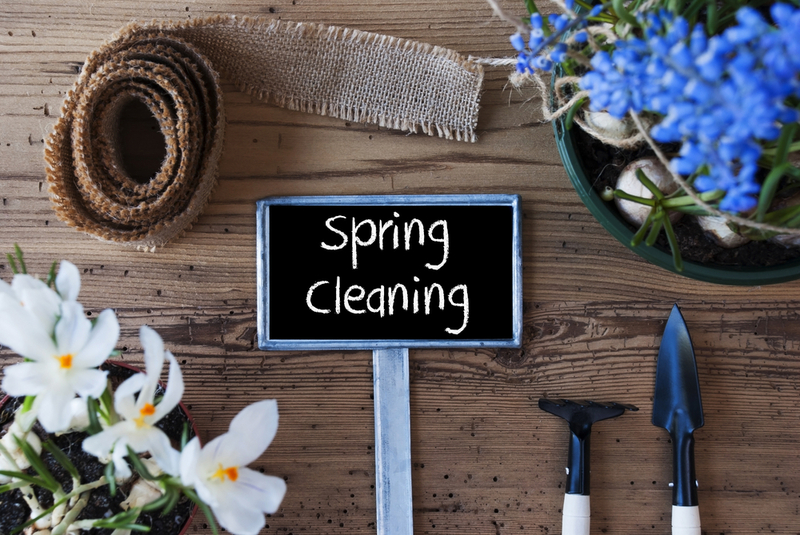 Whether you’re preparing to sell your home, wondering what to do now that your little ones have flown the nest, or simply looking to improve your peace of mind, follow these 6 spring cleaning tips to make your home spotless. We get it. The college sweatshirt you’ve had since the 90s might not have seen the light of day in decades, but it has sentimental value. The pair of jeans you wore every day pre-pregnancy could still come in handy, after a few more trips to the gym. For whatever reasons, we hold on to pieces of clothing for maybe a bit too long. Soon, our closets can become cluttered, and it becomes nearly impossible to find what we need. This spring, say goodbye to the clutter and hello to a clean, organized closet. Empty out your closet onto your bed and ask yourself these 5 Questions about each item of clothing. If you answer no to any of the questions, maybe it’s time to reconsider its place in your wardrobe. Once you’ve carefully chosen the clothes you know you love and will wear, color-code your closet. It will leave you feeling organized and relaxed any time you open your closet doors. making the effort to embrace spring cleaning is all worth it when you get that ahhh feeling. If you’re anything like us, the bed is one of the most important places in the house. It’s where we spend one-third of our life, so why suffer through sleeping on dirty bedding? Show your bed – and yourself – some love this spring and deep-clean it, leaving it fresh and ready for a new season of deep, relaxing sleep. Unless your mattress is pillow-top, begin by flipping it upside down to let the new side breathe. After removing the bedding, vacuum your mattress to get rid of any dust and mites that collected throughout winter. If you want to take it an extra step, leave your mattress and bedding outside for a day of fresh air. To fluff up your pillows, put a clean sock around two tennis balls and stick them in the dryer with your recently washed pillows. This will help prevent the fibers from clumping and will leave your pillows soft and ready for a good night’s sleep. Spring cleaning means paying attention to detail and taking the time to clean out the most overlooked spots, like your bed! Our kitchen appliances treat us well, so this spring consider returning the favor. Take a little time to clean those hard-to-reach places that will leave your kitchen sparkling, whether it’s for a future open house or just for your own benefit. We would hope that the machine used to clean our dishes would be just that—clean. After a number of uses, however, dishwashers can become as dirty as the dishes we put in them. Luckily, this simple recipe of white vinegar and baking soda should do the trick in one cycle. For cleaning the inside of your refrigerator, all it takes is 3 easy ingredients: dish soap, baking soda, and warm water. Use this quick combination to help scrub the shelves until they shine. To clean the outside, a soft cloth and warm soapy water will leave the surface of your refrigerator as polished as the inside. Everyday use and past decorating attempts can cause walls to become scuffed and marked. If you’re looking to put your house on the market this spring, or just hoping to freshen up your home, don’t spend unnecessary money on paying someone to make your walls look brand new. Save money by following this quick how-to by Better Homes and Gardens on spot-checking your walls based on the paint used – latex or oil-based. Avoid the unnecessary fees of rehiring someone to repaint your walls and spot-check those scuff marks yourself. If you’re anything like us, our pets and kids rule the house. Unfortunately, that means they rule the floors, too. We’re always finding new fur balls hidden in the carpets and scratches on our hardwood floors. This spring, give a little care to the floor beneath your feet so the roof over your head feels clean and welcoming. Before deep cleaning the carpet, vacuum to pick up any extra fur or crumbs dropped by the pets and kiddos. Then spot-check small stains hidden in the carpet by spraying the marks with one-part white vinegar and one-part water and wipe away the stain after 15 minutes. Finally, use a steam cleaner to pick up all of the dirt and debris hidden deep within your carpet’s fibers. It’s recommended to steam clean your carpets twice a year, so get it done during spring cleaning when you’re motivated to make your house spotless. To fix surface scratches on the hardwood floors, we recommend using hardwood floor cleaner and protective coating to help remove any pet tracks and surface-level scrapes. Just a few minutes of your time will leave your floors shining and your home looking good as new. Oftentimes, the laundry room gets the short-end of the spring cleaning stick. While it might see less use than some of the other rooms in the house, dust and grime can still collect and become unsightly. Make doing laundry more enjoyable by deep cleaning your laundry room this spring. Just as we want our dishwasher to be clean, we want our laundry room washing machine to be spotless, too. Disinfect your washing machine with a mixture of vinegar, baking soda, and water. We recommend doing this easy trick once a month to keep your laundry room smelling fresh. If after you deep clean those floors and empty out those closets, and you realize you have more space than you thought, give us a call! We’d love to give you the information you need to make your home listing-ready and help you find a house that fits your budget and your stuff. If you have any question, contact Stacy & Nicole today! Happy spring cleaning!